A parfait bar in a York County, Virginia school. YORKTOWN, Virginia – York County School Division (YCSD) in Virginia was awarded a Fuel Up to Play 60 grant from the Southeast United Dairy Industry Association, Inc. (SUDIA) to purchase eight mobile carts with inserts to keep smoothies and parfaits cold. The grant also supports new immersion blenders and signage to promote healthy menu options. 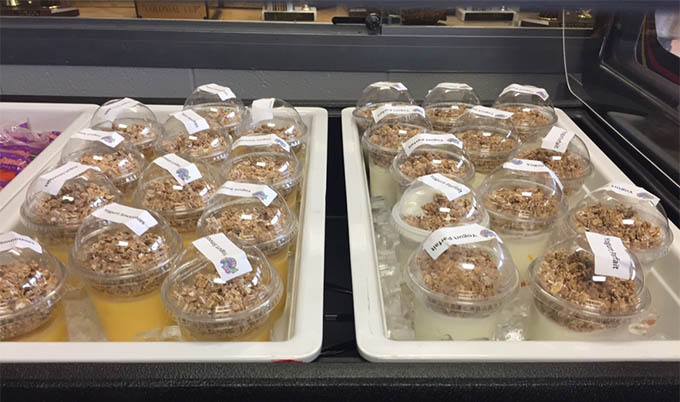 Within the first year of implementing parfait and smoothie bars in York County schools, student yogurt consumption more than doubled in its secondary schools. The district continues to expand its use of parfait and smoothie stations to create separate and unique spaces for each secondary school while offering yogurt options during the transition. “We are constantly challenging ourselves to be on top of student food trends today,” said YCSD Food Service Director Michelle Knotts. By expanding nutrient-rich yogurt options on their menu, York County is bridging the nutrition gap. The smoothie and parfait bars make it easier for middle and high school students to fuel up on the recommended health benefits of dairy to maintain strong bone health and healthy bodies. A parfait bar in an Owen County, Kentucky school. OWENTON, Kentucky – Prior to August 2016, breakfast participation in Owen County (Kentucky) Schools was lower than desired. School Nutrition Director Amy Chappell sought to increase dairy-rich menu options and encourage students to try breakfast by actively engaging them in the process. 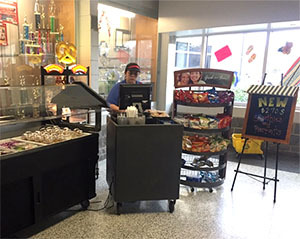 In late 2016, Chappell created a self-serve yogurt parfait bar at Owen County High School (OCHS). It was so successful that it was added as an option at nearby Maurice Bowling Middle School (MBMS). Chappell funded the parfait bar expansion with a Fuel Up to Play 60 School Nutrition Equipment Grant. OCHS technology students assisted in creating visually appealing signage and posters for the parfait bars. 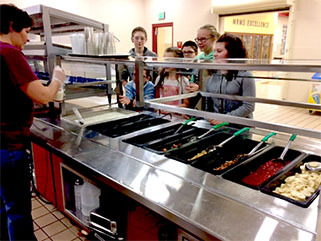 Thanks to the parfait bar, OCHS experienced an 18.1 percent increase in breakfast participation from the previous year and MBMS had a 16.7 percent increase.